AERONAUT Automation’s Maxis LC pizza wheel plotter cutter is a simple and robust machine priced to bring precise, accurate computer controlled cutting and plotting within the reach of every factory or trade. The Maxis LC plotter cutter uses the latest motion-control technology combined with simple and rugged engineering. The Maxis LC delivers smooth plotting and powerful cutting of industrial and recreational textiles at the same speed and accuracy as machines costing five times the price. The machine is designed to span up to 2.05m wide to work with the majority of fabric used in general canvas work, shade structures, tension membranes and sailmaking. It can be fitted with cutting tools for making signs, banners and logos. The Maxis LC plotter cutter is expandable, easily installed and low maintenance. Machines mount flat on the table top and can be fitted to existing tables. Machines can be expanded in length and width at any time without extensive rebuilding and re-calibration. 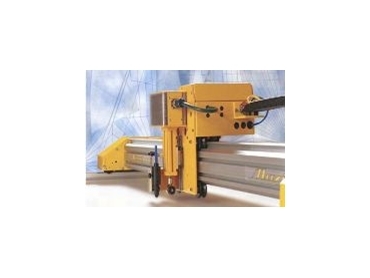 * Cutting widths up to 2.0m and cutting lengths up to 15m.